For the highest quality patient care, medical professionals need confidence in their skills with the patient interview. 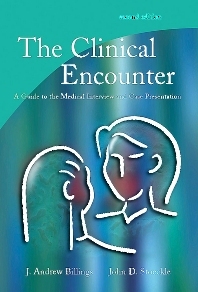 THE CLINICAL ENCOUNTER: A GUIDE TO THE MEDICAL INTERVIEW AND CASE PRESENTATION provides the tools and practical guidelines needed for clinical practice. Part I addresses the basics in the medical interview. Part II focuses on advanced topics and problems that students and physicians may encounter on a daily basis. It features doctor-patient dialogues and vignettes on how to act and respond in any patient encounter in a respectful, caring way. The authors' clear writing style and specific suggestions offer guidance for easing difficult and sensitive situations relevant to day-to-day clinical settings. Features clear, easy to read writing style to facilitate understanding and aid in improved patient interactions. Divides topics into essential and advanced topics which allows user to access topics of immediate need. Provides boxes and tables to summarize important topics for quick access and retrieval of information. Describes situations that most physicians will likely encounter in practice to make content relevant and extremely useful. Provides interesting quotations from famous and not so famous for meaningful comments and humor to a serious topic Features thoughtful text with warm, caring, respectful guidance for patient interaction to help healthcare professionals be human, not just rushed, fact-finders. Provides practical examples and sample questions and statements to help patient feel comfortable and doctor obtain needed information to give user ideas for every situation of how and what to say to build confidence and skill when talking with patients.